Dodgers Blue Heaven: Welcome to the Blue, Wilmer Font! Now that September is here a bunch of new faces are turning up in Dodger Blue. One of whom arrived over the weekend. His name is Wilmer Font, and he had been one of the Pacific Coast League's best pitchers. 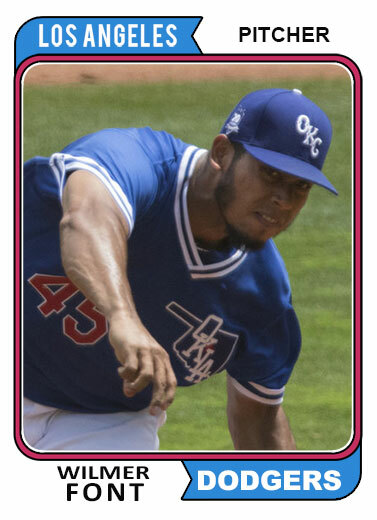 Font, 27, who will make his Dodger debut and his first big league appearance since 2013, went 10-8 with a 3.42 ERA (51 ER/134.1 IP) in 25 starts for the OKC Dodgers this season. Prior to his promotion, Font led the Pacific Coast League with a career-high 178 strikeouts and earlier in the month set Oklahoma City’s all-time single-season strikeout record since the team rejoined the PCL in 1998. On Monday, he was named to the 2017 All-Pacific Coast League Team after leading the PCL in ERA, WHIP (1.11), opponents’ batting average (.222) and strikeouts per nine innings (11.93), while also ranking among the best in starts (T-2nd), wins (T-3rd) and innings pitched (6th). Font was also named a midseason PCL All-Star and started the Triple-A All-Star Game on July 12, retiring the side in the first inning on four pitches. He was named PCL Pitcher of the Week twice this season, taking home the award for the periods of May 15-21 and July 10-16. The La Guaira, Venezuela native appeared in five big league games over two seasons with the Texas Rangers (2012-13), allowing two runs in 3.1 innings (5.40 ERA) and holding hitters to a .091 average. Over nine minor league seasons, Font has gone 38-29 with 18 saves and has posted a 3.61 ERA in 203 games (105 starts) with the Rangers (2007-14), Blue Jays (2016) and Dodgers (2017) organizations. He has held batters to a career .218 average in the minors and has struck out 730 batters against 271 walks in 618.2 innings, posting a 10.62 strikeout per nine innings. The minor leagues are full of good stories, and Font has one. He missed all of 2011 with Tommy John surgery before reaching the majors by the end of 2012 with the Rangers, who also called him up briefly in 2013. But he’s been cut (Reds, 2015) and pitched in indy ball (Can-Am League) before finding a home this year with the Dodgers. The 27-year-old has been the best pitcher in the Pacific Coast League. The 6-foot-4, 265-pound Font is 10-8, 3.42 with 178 strikeouts in 134 innings; he leads the PCL in whiffs and ERA and is second in wins, giving him an outside shot to still win the PCL pitching triple crown. He’s also pumping mid-90s gas. The Dodgers don’t need Font and don’t have room for him on their 40-man roster, but I’d love to see Font get a shot as a reward for his 2017 exploits. Unfortunately, since being called up he has not shown his best. Font has had two relief stints while in Los Angeles. On Saturday he came in to start the fifth inning during the first game of the weekend doubleheader and could not hold the lead. He went 1.2 innings, gave up two hits, three walks and two runs. Then last night he got pummeled. In what can only be called mop-up duty, Wilmer entered the ninth inning of last nights laugher and proceeded to give up four runs on three hits. Hopefully, he'll rebound and show some better results. 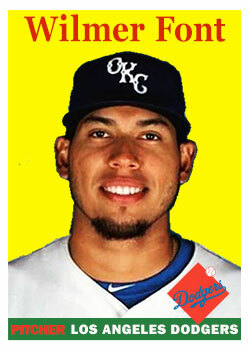 In the meantime, check out some Wilmer Font fantasy cards I made of Wilmer above.